Published on Sunday 26. April, 2009 in Family, Göbels and Uncategorized. 0 Comments Tags: Deisfeld. 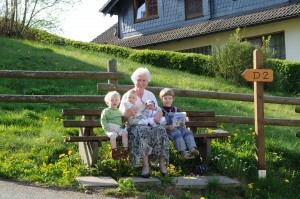 Grandma Regina and her grandchildren at Harald’s confirmation in Deisfeld. You are currently browsing the The world & us weblog archives for 'deisfeld' tag.